ST. GEORGE — Roadwork through Washington County is once more on the horizon as the Utah Department of Transportation is set to begin improvements on the Exit 16 interchange of Interstate 15. NOTICE: Access on and off of the Exit 16 interchange from southbound I-15 will be closed between 8 p.m. Monday, Feb. 18, and 6 a.m. Tuesday, Feb. 19. Motorists are advised to go to the Washington Parkway/Exit 13 interchange and take Telegraph Street to access state Route 9 to the north or Washington City and St. George to the south. The project began Feb. 11 and is anticipated to run through November. It is the latest in a series of improvements recommended by a 2013 study that focused on the I-15 corridor between miles 0 and 16, according to UDOT. “This will make it easier for the more dominant traffic patterns to get on and off I-15,” spokesman Kevin Kitchen said. The dominant traffic patterns are those running between Hurricane and St. George. “We will widen the bridges to accommodate additional travel capacity and also widen SR-9 as it approaches I-15,” Kitchen said. Addition of a second lane to the I-15 northbound exit ramp to eastbound SR-9. Addition of a second lane to the SR-9 westbound entrance ramp to southbound I-15. 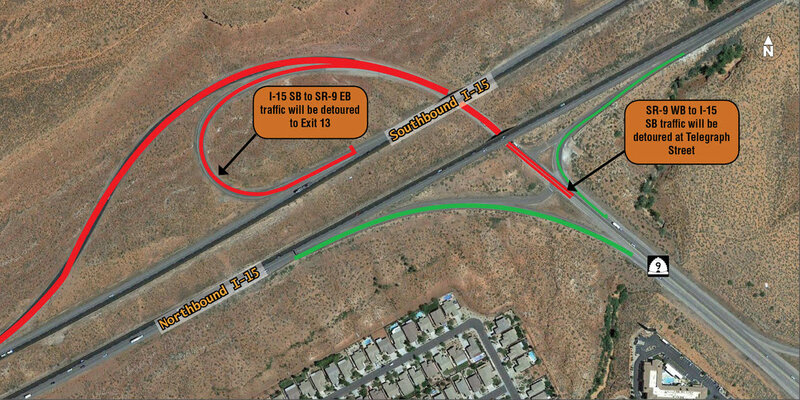 Addition of another lane on westbound SR-9 between Coral Canyon interchange and I-15 entrance ramp. Addition of a third southbound lane on I-15 between SR-9 and Exit 13. Improvement of curves and speeds on all ramps. Reconstruction to widen and lengthen bridges on I-15 over SR-9. Extension of northbound I-15 truck lane through the interchange. Part of the widening of the roadway connecting I-15 to SR-9 will involve removing the pillars holding up the current bridges, Kitchen said. The overall project is estimted to cost $29 million. There will be overnight ramp closures taking place during the project, Kitchen said. Those closures will primarily affect the southbound ramp. The first of the overnight southbound ramp closures is scheduled for Feb. 18.